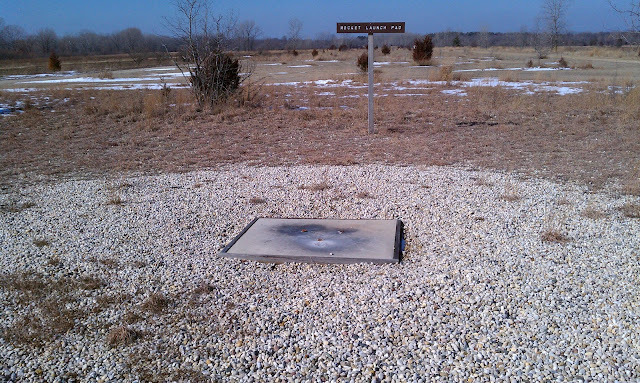 Yesterday I began the strange tale of my visit to the Richard Bong State Recreation Area in southeastern Wisconsin ("Area 51 1/2," 2/15/2012), otherwise known as Wisconsin's very own secret UFO base (and the possible point of origin of the Burlington Vortex UFOs...). Another sign not visible in this picture said some nonsense about how access was limited and I needed a permit to proceed any further, so of course I ignored it and plowed ahead. Reflecting on my Area 51 experience of a few years back ("Area 51 Decoded -- Part 2," 9/21/2011), I reasoned that, if the Bong people didn't have armed guards posted at the entrance and big scary signs warning me that deadly force would be used against me if I tried to enter, I pretty much had a gold-plated invitation to waltz right in. So I did. I soon came across an eerie, otherworldly sight... Scattered around the bleak, featureless prairie were seven or eight humanoid beings dressed in brilliant white uniforms with odd insignias and strange electronic devices around their necks, sitting in lawn chairs. Not sure what sort of alien activity I had stumbled onto, I pulled up to the first humanoid along the road and asked "her" what was going on. "Field training," she replied in a flat, robotic voice. It was then that I saw a sleek black pointer racing through the grass with a pheasant in its mouth. Could the aliens be trying to manipulate the human race by way of our hunting dogs? Is this the special use that the "Special Use Zone" is used for? I wanted to probe further, but I was keenly aware that I was vastly outnumbered by these humanoids, so I trod carefully. "Will I be interfering with your 'field training' if I keep driving through?" I asked politely. "If you go much further, yes," the being replied. I knew then that I was on dangerous ground. Should I gun it and see how far I get before they send their "dog" after me? Should I try to make it back to the ranger station to warn them and all humanity of the threat we were facing? I decided to play it cool, which is pretty much how I roll. "How much further to the rocket launch pad?" I asked. "That's what I came here to see." The being in the lawn chair remained eerily calm, matching my coolness with her own alien coolness, which, considering it came from the icy cold depths of outer space, was far cooler than my cool. "It's just on the other side of the trucks," she said, pointing to the group of 4x4 pickups and minivans parked a hundred feet ahead. My God," I thought, the cunning bastards have even learned to drive our vehicles! It wasn't much to look at, frankly. Just a three-foot square concrete pad covered with scorch marks and surrounded by pea gravel. But it jogged something loose in my brain... Wasn't I looking due northeast, precisely in the direction of the Burlington Vortex? Indeed I was. Was it possible, I wondered, that some amateur rocketry group could have launched two rockets last October 29th at around 10:30 p.m., and sent them rocketing six miles east to the Vortex, where they might have been seen by 30 or so excited and impressionable UFO buffs out on a crazy Haunted Woods Tour and taken to be UFOs??? Maybe, I thought, Bong isn't a secret Air Force-sponsored UFO base. 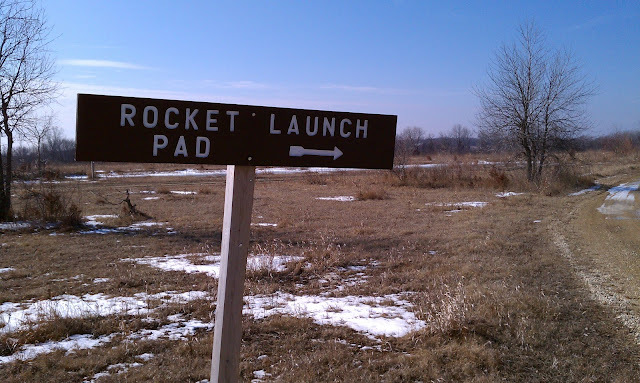 Maybe it's just a place where rocketry clubs made up of mere humans launch their toy rockets for kicks... Damn, what a let down. Still, as a UFO Field Investigator in training, I felt I had to follow-up on this lead. Sure enough, there is a club called Tripoli Wisconsin that launches regularly from Bong, and some of these toy rockets are as big as a flipping house. Could they really travel 6 miles? Mystery solved! Or is it...? I was right back where I started. What is Bong really? Can any of it be trusted? I drove slowly and quietly away from the "dog trainers" and considered everything I had seen and experienced. There was definitely something odd and artificial about this "recreation area." I saw a hawk swoop past and all I could think was "Damn, their animatronics are lifelike!" Even the "beach" was suspect. The lake was iced over, and there wasn't a single swimmer in sight. I drove home in deep reflection. There is something odd going on at Bong, and I will suss it out, even if it takes me the rest of the month.